Despite the US strong economic reports, USD declined after president Trump criticized the Fed’s policy of gradual rate hike. 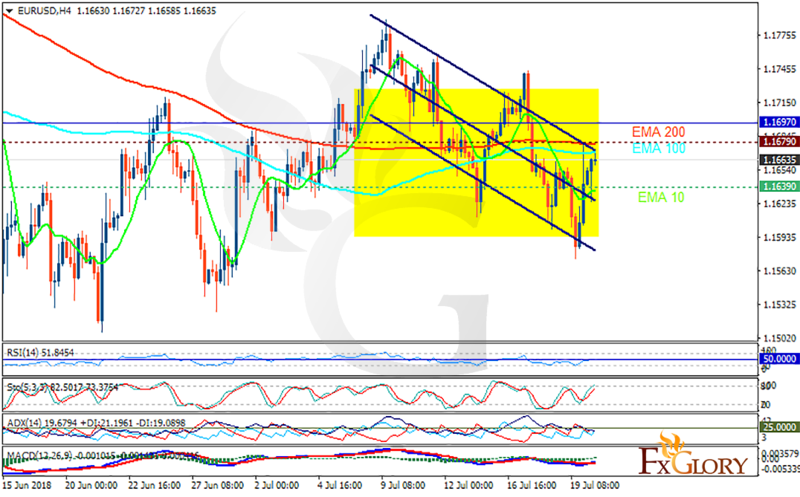 The support rests at 1.16390 with resistance at 1.16790 which both lines are below the weekly pivot point at 1.16970. The EMA of 10 is moving horizontally in the descendant channel and it is below the EMA of 200 and the EMA of 100. The RSI is moving on the 50 level, the Stochastic is showing upward momentum and the MACD line is above the signal line in the positive territory. The ADX is not showing any clear signals. The resistance level breakout will push the price up towards 1.172, otherwise, EURUSD will continue its bearish trend towards 1.159.